Pasta. It’s what’s for dinner at Lincoln restaurant in Portland, Oregon, and executive chef Jenn Louis wants you to make it yourself. By hand. 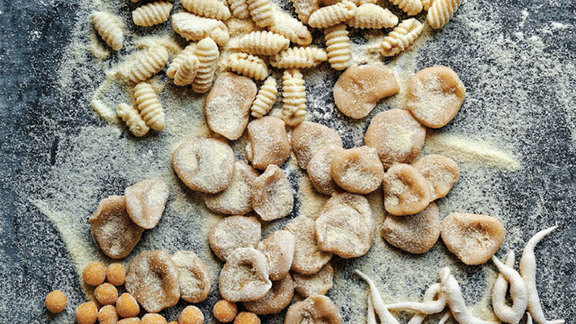 Louis became passionate about gnocchi after traveling around Italy and has dedicated her new cookbook, “Pasta By Hand,” to dozens of traditional gnocchi recipes from 18 distinct regions in Italy. The book will be released on March 23. We chatted with Louis about how to define gnocchi, how she stumped Mario Batali and which recipe in the book she found the most intriguing. Bonus: We’ve teamed up with Louis to give away three copies of “Pasta By Hand.” Follow us on Twitter at @ChefsFeed on Monday, March 23 to find out how to win. Chefs Feed: Mario Batali wrote a beautiful forward for "Pasta By Hand." How do you two know each other? Jenn Louis: We originally met at an event in Aspen. Then when I was touring in Italy, he reached out via Twitter, sent me his cell and helped guide me around to a few places. From there we texted and talked throughout the writing of my book. I think it was all of my tweets about drinking negronis that caught his attention! Why is it so hard to define gnocchi in Italian? They don’t have a word for dumplings, and semantics have kept the definition from being clear. There’s pasta lunga (long pasta), pasta corta (short pasta) and stuffed pasta. Ravioli could be considered dumplings but they consider it a stuffed pasta. Gnocchi is a potato dumpling. This is the biggest thing I want people to understand: I realize there are all these different pasta shapes but there’s an overarching style that unites them all. They’re simmered in water, made by hand and use local ingredients. This is how I define gnocchi: all gnocchi are dumplings but not all dumplings are gnocchi. There are gonna be some disputes about what’s in the book and I think that’s great. Is there any anxiety about gluten in Italy like there is here in the U.S.? Absolutely. The last time I was in Italy, I noticed in the farmacia (pharmacy) that they had gluten-free pasta. It’s kind of an interesting thing to look at. We sell gluten-free pasta in grocery stores but in Italy it’s sold at the pharmacies. They do recognize (celiac disease) as condition but it’s like a natural disaster. It’s a big deal. I thought you were gonna say, “no, it’s not a big deal there”! This is hard question, but do you have a favorite Italian region? That’s a hard one. I’m kind of a liker—I like to like things. I’ll travel anywhere and find something to like. Italy is a wonderful country and the people are really proud of their regions. Of all the types of gnocchi you encountered while traveling around Italy, did any of them surprise you—in any way, shape or form (pun intended)? Yes, the royale bolognese. It’s where you add grated parmesan, egg and nutmeg (to the dough) and roll it into cheesecloth like a sausage. Then you put it into a broth with chicken or beef trim and poach it. It tastes like the best Cheezits ever. It’s crazy delicious and so unique. I remember texting Mario (Batali) one day and asking him, “hey, have you heard of this?” And he said, “no.” I found things in Italy that haven’t gotten out there. This book is my way of making sure these things don’t get lost. What’s the simplest gnocchi recipe in the book? It’s a really simple food and they’re all really approachable recipes, but the “gnocchi with egg and ricotta” is a good one to start out with. What’s a more complicated or involved type of gnocchi in the book? The passatelli. Those are tricky. Certain gnocchi have more of a delicate dough. Adding ricotta gives it a wonderful texture. Nettles are in season, so at Lincoln we’re serving nettle gnocchi and ricotta gnocchi. It always changes but there’s at least one type of gnocchi on the menu.